Thai Songkran Festival 2019 - Water Fight! It's water, water everywhere -- during Thailand's annual Songkran festival. Songkran (สงกรานต์) is the traditional Thai New Year water festival which starts on April 13 every year. The word Songkran comes from the Pali language of the Therevada Buddhist scriptures (Sankhara) and the Sanskrit word (Sankranti) for movement or change. In ancient times, it was celebrated as a moveable feast, and set to occur as the sun moved into the Aries portion of the zodiac. In modern times the date has been fixed as April 13. This year, Songkran festivities begin on Saturday, April 13, 2019. Although the Thai people officially changed the New Year to January 1 in 1940 to coincide with the Western world, the traditional Songkran Festival is still celebrated as a national holiday in Thailand. The festival lasts for 4 days. The Songkran Festival shares some similarities with the Holi festival in India celebrated around the same time. One custom that Songkran shares with Holi is the releasing of small fish back into the rivers and steams. In Thailand, small birds may also be released from cages as part of the festivities. While in India the throwing of colored water marks Holi, the Thai Songkran Festival involves throwing clear water - and lots of it! 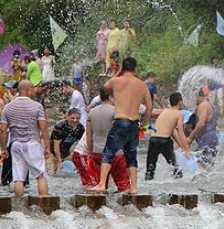 - although many add colored powders and scents to the water in Thai New Year celebrations in playful "water wars." The tradition traces back to the pre-Buddist rituals of spring festivals where the throwing of water was meant as a symbol of luck to bring good rain for the crops. It was later converted to the religious custom of cleansing the statues of Buddha once a year. In many places there are parades with the statues of Buddha and as the parades pass, crowds shower the Buddha with water. Pouring small amounts of scented lustral water on the heads of the elders on Wan Parg-bpee as a sign of respect is also part of this custom. In many temples throughout Thailand people bring sand to symbolically replace the sand that they have carried away on their sandals throughout the year. The sand is formed into pagodas called phra chedis sai and decorated with colorful flags as part of the Songkran New Year festivities. It may be that this tradition began as part of the cleansing rituals where new sand was added to the floor of the temple once a year. The foods that are served at traditional Songkran Festivals depend on the part of Thailand you visit. Pad Thai Noodles; Khao Chae, a delicious rice dish; Gaeng Kiew Wahn Gai, chicken with green curry; krayasad, a mixture made from puffed rice, oats, peanuts and Thai noodles that is sweetened with palm sugar and coconut syrup; Kanom Tom, sticky rice and mung bean balls piled high into a pyramid shaped dessert and Kanom Krok, coconut rice pancakes are some of the more universal Thai foods enjoyed during the Songkran festival. Songkran History and Origin - Check out an entertaining explanation of the history of the Songkran Festival with all of the traditions and modern day celebrations. Thai New Year Recipes - If you are planning a Songkran festival of your own, or just feel like having some delicious Thai food for dinner...these recipes cover the meal from salads and appetizers through desserts.